$12 for children, $6 for adults. Trick or treating in the historic village! Tasty treats for costumed kiddies as well as crafts, apple bobbing and games! Kids bring your parents! Bennett Cafe will be open from 3:30-5 PM serving vanilla and chocolate cupcakes (nut free), juice, and water. 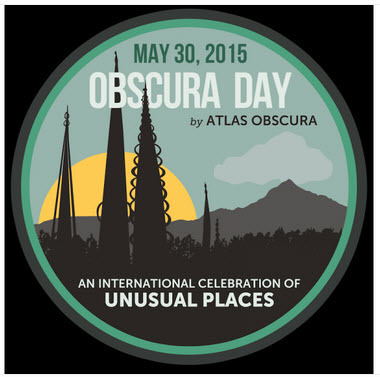 Obscura Day is the real-world manifestation of Atlas Obscura – a day of expeditions, back-room tours, unusual access and discovery in your hometown. More than just cataloging the curious, wondrous and overlooked places of the world, we’d like to encourage you to actually go out and explore them. Special events will be taking place at unusual locations across the globe as we highlight obscure collections, eclectic museums, hidden wonders and curiosities near and afar to show that the same sense of wonder invoked by exotic travels can be found close to home if you know where to look. The New York City Farm Colony – Built in 1898 as a self-preserving housing community for the impoverished or otherwise socially outcast, its beginnings were utopic in essence; 2,000 residents would produce over 3,000 vegetables, more than enough to sustain themselves. Due to the advent of Social Security and drugs like Thorazine in the 1950s, however, the community was stripped of most of its able-bodied workers and essentially became a geriatric center. And so, like many other farm colonies, the colony could no longer sustain itself and was sealed and abandoned in 1975. But this only marked the beginning of a far more sinister period of its existence. Fort Wadsworth – The first fortification on the site was a small Dutch fort built in 1663. The fort passed into English hands in 1776, when the British took control of New York during the Revolutionary War, then reverted to New York’s control at the war’s end. The city expanded a bit, starting work on three more forts, but none of them were finished by the beginning of the War of 1812, and the new Federal government had to step in and rush the job. Only 15 years later, the government declared the slapdash forts “unfit” and decided to start over, knocking down all four and replacing them with a pair of much larger forts — Fort Richmond, on the beach, and Fort Tompkins, on the hill just above. They completed both structures in 1861, shortly after the onset of the Civil War. Historic Richmond Town – What do you do when you lose your county seat? Stop Time! What to do when you lose your county seat? Stop time. At least, that’s how Historic Richmond Town dealt with the end of their hey day as Staten Island’s commercial and civic center. Originally a crossroads settlement, Richmond Town became the center for business and government on Staten Island in the 1700s, bustling with blacksmiths and shoemakers and court sessions. But by the time SI became a part of the five New York City boroughs in 1898, the once happening town found itself in a gradual decline. So they stopped moving forward! 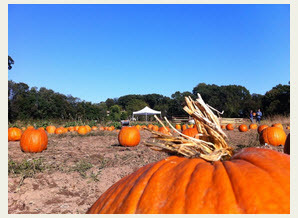 Pick your own pumpkin at Decker Farm in Historic Richmond Town this weekend and next from 11am to 4pm. Visit the historic 1800s Decker Farm and bring home a pumpkin! Enjoy a self-guided tour, hayride, face painting, farm animals, arts and crafts, and corn stalk maze. Free shuttle bus service available from the Historic Richmond Town parking lot to the farm. All tickets sold at the door! Enjoy a day filled with family fun on the historic early 1800s Decker Farm. Get creative with fun arts and crafts. And take home a pumpkin! Free shuttle bus service from the Historic Richmond Town parking lot to the Farm. 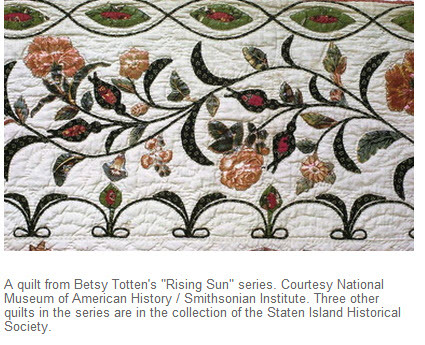 Although dozens of Staten Island needlewomen are represented in the 170-piece quilt collection of Historic Richmond Town/Staten Island Historical Society, none enjoys the renown of Mary Totten (1781-1861), whose family apparently became identified with Tottenville. The gifted and inventive Totten’s quilts have traveled far from the South Shore. The New York State Historical Association (Cooperstown) owns one, as does the Smithsonian Institute. One of her Star of Bethlehem patterns, a popular 19th-century design, is even available as a poster peddled on-line. Richmond Town owns two Tottens, both made in the 1830s and both sewn and pieced in the popular Star of Bethlehem design, surrounded by “leaves with wandering vines with flowers.” The more elaborate of the two adds birds to the vines and flowers surrounding its central star. These days at Richmond Town, 441 Clarke Ave., visitors will see authentic-looking coverlets in the “living history” village’s restored period interiors, but all are reproductions. The real quilts are too rare, valuable and fragile for long-term display. The only whistling/harmonica/ukulele/fiddle/guitar/banjo/jew’s-harp/mandolin/bass/vocal harmony group around! Great traditional music with a few originals thrown in! To purchase tickets or for more information, call (718) 351-1611 x281 or go to www.historicrichmondtown.org. Why not visit the Richmond County Fair? There’s something different in the air at this year’s Richmond County Fair. You might say the event has gone to the dogs. Running, flying, and leaping dogs! This year, the 33rd annual spectacular will be headlined by World Series pitcher Milt Wilcox and his Ultimate Air Dogs. This acrobatic attraction features athletic dogs that soar 20 feet in the air and splashdown into a huge pool while performing feats of strength and agility. Another exciting addition to the Fair is local sandman and reality TV star Matt Long. Long will create an epic sand carving near the Fair entrance. The surprise sculpture will take three days to construct. Children can watch it rise from the ground while getting their own fingers into the action. Long will be running mini-workshops, offering the kids a chance to create their own works of art. One-day passes can be purchased at the Staten Island Time Warner Cable store for 20% off – $12 instead of the at-the-door price of $15. Avid fairgoers, who often revisit, can buy three-day unlimited passes online at historicrichmondtown.org for only $20, a savings of over 50%. As always, children 30” and under are free. All the entertainment is part of the package: the AWE stage for young rockers, illusionists, reptiles, kiddie rides, costume characters, pony rides, acrobats, jugglers, the antique Advance delivery truck, flea circus, puppets, fire trucks, classic cars, traditional demonstrations, sand sculpture, Air Dogs and much more. Celebrate Independence Day at Historic Richmond Town! Enjoy a pie-baking demonstration and bring a pie you baked at home to enter the Pie Baking Contest: an exciting competition that pits ordinary citizens of today against expert “colonial” cooks, judged by volunteers. Help to churn old time ice cream, participate in the Pinwheel Parade, and meet patriotic villagers from the 1800s and earlier. Regular village admission, FREE for SIHS members.